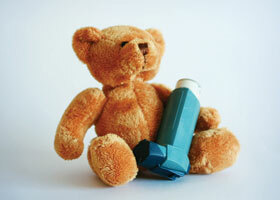 In order to manage the allergy symptoms that lead to asthma attacks, it’s critical to control the indoor environment. Common indoor triggers include dust mites on pillows, blankets and stuffed animals; mold in bathrooms; dust and pet hair in carpeting; cleaning sprays and pesticides; air fresheners and candles and mouse and cockroach droppings. One of the first steps is replacing sprays and cleaners with nontoxic alternatives, and then embracing a weekly cleaning regimen that aims to keep the dust, mold and insects at bay. The U.S. Environmental Protection Agency reports that the average American spends 90% of his or her time indoors and that levels of pollutants are typically two to five times as high inside homes compared to outside. Sometimes (during house painting for instance) indoor air is more than 100 times more polluted. Children, because of their smaller bodies, are more vulnerable to the impacts of bad indoor air. Here are 10 steps to make your home air more breathable. 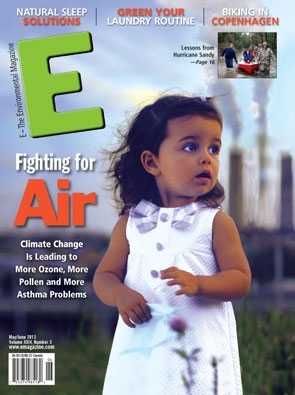 (1) A couple recent studies have tied the use of common household cleaners with increased risk for asthma. Making your own cleaners (such as distilled white vinegar and water in a spray bottle) will save you money, prevent worries of toxic exposures on the part of young children and keep asthma-triggering irritants out of the air. (2) Dust mites are microscopic eight-legged creatures that feed on human skin scales, pet dander, mold spores and pollen. They tend to congregate where people and pets sleep, and for those allergic to dust mites (or more specifically, dust mite droppings) the creatures are a common asthma trigger. Both mattresses and pillows can be covered with a special protector that will prevent dust mites from congregating—and organic versions are available from Amazon, Bed Bath & Beyond and allergystore.com. (3) It’s a chore, but washing all bedding weekly in hot water is a sure way to get rid of dust mites. Use laundry detergent that won’t leave irritating chemicals behind from brands like Seventh Generation, Method, Mrs. Meyers and Ecover and since you have to wash in hot water, line dry in the sunshine if possible. (4) Chances are your pillows could use an upgrade. Rather than the allergy-free synthetic options available at the local big box store, opt for organic latex or organic kapok pillows from companies like Savvy Rest and CozyPure. (5) HEPA stands for high efficiency particulate air, and vacuums with HEPA filters remove all particles .3 microns or larger at a rate of 99.97% (for comparison’s sake, a human hair is 80 to 100 microns in diameter). Ultra Low Penetration Air (ULPA) vacuums go one step further, filtering air particles that are .12 microns or larger at an efficiency rate of 99.999%. 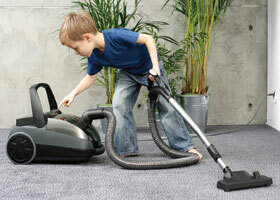 These are the same vacuums used to clean up hazardous dust and particles (such as lead contamination) at work sites. Beyond this basic guideline there are a host of other things to consider— including whether you have carpeting and pets. A “Healthy Air” fact sheet from the University of Illinois recommends that “To really get a carpet clean, pass the vacuum cleaner over the target area as many as eight times.” And don’t forget to vacuum fabric-covered furniture and curtains, too. (6) You can avoid all that endless back-and-forth with the industrial-strength vacuum cleaner by removing carpeting altogether. If you choose to have area rugs, make sure they are washable. 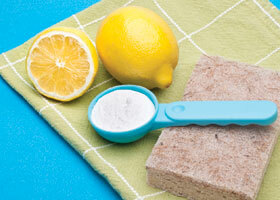 (7) The more you can de-clutter, the easier it will be to keep dust—and dust mites—under control. Embrace bins, particularly for stuffed animals, and keep the amount of stuffed animals on allergy- and asthma-prone kids’ beds to a minimum. For stuffed animals that a child can’t sleep without, run them in a dryer before bedtime. (8) Humid air is itself an asthma trigger, but it’s also dangerous for other reasons. Humid conditions breed mold, a potent allergy and asthma trigger, and dust mites thrive in humid environments. A hygrometer is an inexpensive batteryoperated device that allows you to track the relative dryness and humidity of your indoor air and will let you know if you need to purchase a dehumidifier to control moisture. You want humidity levels no higher than 50% according to the Centers for Disease Control and Prevention. (10) Integrated Pest Management is a chemical-free approach to keeping rodents and insects out of your home. Strategies include covering and regularly emptying garbage cans; fixing leaks to eliminate dripping water sources; cleaning counters and dishes regularly to avoid attracting pests; sealing rodent entryways under doors, around pipes and other openings; and setting traps in locked, child-safe rodent boxes.